Gift from the Rev. John H. W. Rhein, Saunderstown, Rhode Island, to the University Archives December 10, 1975; letter from Eisha Kent Kane to unnamed recipient transferred from Edgar Fahs Smith Library to the University Archives February 1978. The collection is organized into two series: Correspondence, and Elisha Kent Kane files. Both are arranged alphabetically. The Kane family was prominent in Philadelphia society and politics during the nineteenth century. Born in Albany, New York, John Kintzing Kane (1795-1858) came to Philadelphia with his father Elisha Kane in 1801 following the death of his mother. After his father remarried to Elizabeth Kintzing in 1807, John incorporated his step-mother’s maiden name into his own name. After graduating from Yale University in 1814 John returned to Philadelphia and studied law under Joseph Hopkins. He was admitted to the bar and started his practice in 1817. John married Jane Duval Leiper in 1819 and together they had six children: Elisha Kent (1820-1857), Thomas Leiper (1822-1883), Robert Patterson (1827-1906), Elizabeth D. (1832-1869), John Kintzing, Jr. (1833-1886), and William (1838- 1852). John became a prominent figure in Philadelphia’s Democratic Party – actively working on state and national elections, including Andrew Jackson’s presidential campaign. For his various efforts he was appointed Attorney General of Pennsylvania in 1845 and judge on the United States District Court for the Eastern District of Pennsylvania in 1846. John was also involved in Philadelphia cultural institutions – including the American Philosophical Society, Musical Fund Society, Academy of Fine Arts, Girard College, the Law Academy of Philadelphia, and Institution for the Instruction of the Blind. John Kintzing Kane died in Philadelphia in 1858. Elisha Kent and Thomas Leiper became the most prominent of John Kintzing Kane’s children. Elisha, though sickly as a youth from rheumatic fever, graduated form the University of Pennsylvania in 1842 with a medical degree. Believing he did not have the stamina to endure a normal medical career, his father secured him an appointment as a surgeon in the U. S. Navy. 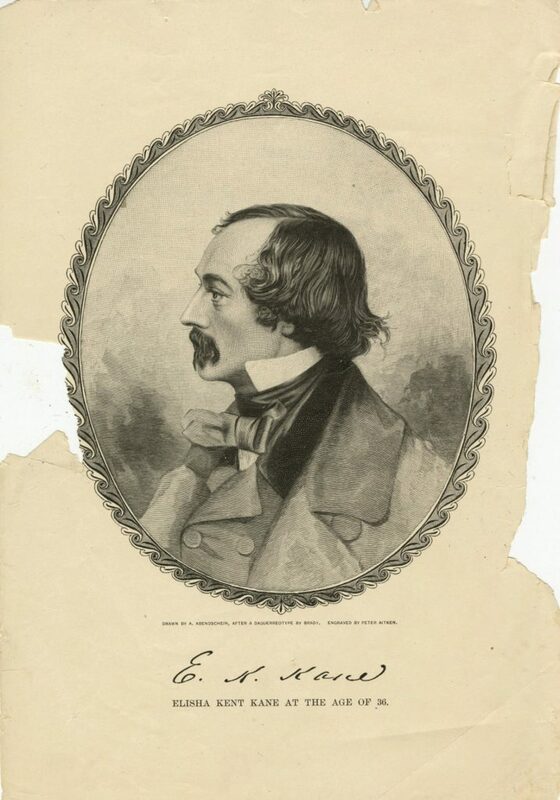 Ironically, Elisha went on to have an adventurous life, including services as surgeon for Caleb Cushing’s diplomatic mission to China in 1844, as a special courier for President James Polk to General Winfield Scott during the Mexican War, and two tours at sea. He also participated in two arctic expeditions to locate Sir John Franklin, one of which he led personally. Elisha’s ill health eventually caught up to him, however, and he died in 1857 after suffering two strokes. Thomas studied law under his father, but never entered practice. In 1846 he began an association with the Church of Jesus Christ of Latter-day Saints (or Mormons) after reading reports regarding the forceful removal from their homes in Illinois. Though he never became a member of the church, throughout his life Thomas was an advocate for the Mormons with the United States Government. Thomas was also active in the Abolition Movement, and served as an officer during the Civil War. He died in Philadelphia in 1883. John Kintzing Kane’s other children had active careers in Philadelphia. Robert Patterson practiced law with his father. John Jr. briefly attended the University of Pennsylvania in 1853, before earning his medical degree from Thomas Jefferson University. Elizabeth married Charles W. Shields (1825-1904), who was appointed Professor of the Harmony of Science and Religion at Princeton University in 1865; together they had one child, Thomas, shortly before Elizabeth’s death in 1869. John Kintzing Kane’s youngest child, William, died at age 14. The Kane Family Papers consists primarily of correspondence to Elizabeth D. Kane from her family. In addition there are letters from Elisha Kent Kane to an unknown correspondent and John K. Kane, Jr. to Charles W. Shields – Elizabeth’s husband. The most significant Elisha Kent Kane material consists of the Bible his mother gave him before he left on the Caleb Cushing Mission to China, and a bound book of letters from those asked to be pall bearers at his funeral in 1857. In addition, there is a receipt book that was used briefly by him during his youth, but also by Abraham and Eliza Kintzing. Finally, there are two articles on his life. Additional Kane Family Papers can be found at the American Philosophical Society, and Historical Society of Pennsylvania. A journal from Elisha Kent Kane’s second arctic expedition is held by Stanford University. Kane, Elisha Kent to Elizabeth D. Kane, n.d.
Kane, Jane D. L. to Elizabeth D. Kane, 1850-1865, n.d.
Kane, John K., Jr. to Elizabeth D. Kane, 1861-1867, n.d.
Kane, John Kintzing to Elizabeth D. Kane,1847 – 1857, n.d.
Kane, Mabel Bayard to Elizabeth D. Kane, n.d.
Bible given to Elish Kent Kane by his mother, 1843, with autograph notes of locations carried.